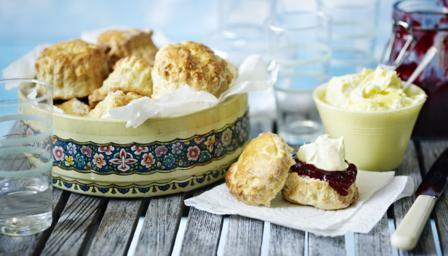 Scones provide one of the best vehicles for clotted cream. The buttermilk in these scones not only gives them a slight tang - all the better to enjoy the jam and cream on top - but is also what yields such a melting, tender crumb. Until you have made a batch of scones you won’t have any idea how easy they are to throw together. Frankly, it shouldn’t take longer than 20 minutes to make and bake them, from start to finish. Preheat the oven to 220C/450/Gas 7. Line a large baking sheet with baking parchment. Put the flour into a bowl with the bicarbonate of soda, cream of tartar and sugar. Chop the butter and the vegetable shortening into pieces and drop them into the flour. Rub the fats into the flour using your fingertips – or just mix any old how – and then pour in the buttermilk, working everything together to form a dough. Lightly flour your work surface. Pat the dough down into a round-edged oblong about 4cm/1½in thick, then cut out 6cm/2¼in scones with a fluted cutter. Arrange the scones fairly close together on your lined baking sheet, and brush with beaten egg (to give golden tops), if you wish. Cook for 12 minutes, by which time the scones will be dry on the bottom and have a relatively light feel. Remove them to a wire rack to cool, and serve with clotted cream and jam.